The Airmax™ Nasal Device, patented by ENT doctors, is a specially designed medical device that increases airflow through the nose, to help people breathe better. What is the Airmax™ Nasal Device? 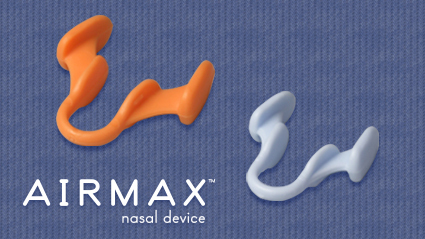 The specially designed Airmax, made of super soft medical grade silicone, has small wings that expand the narrowest parts of the nasal passage to allow increased airflow. This comfortable device provides an effective and very simple solution for all people who have difficulties breathing. The Airmax is perfect for people who have trouble breathing especially whilst sleeping. It is the ideal solution for people who snore at night or who have difficulty sleeping as a result of allergies, colds or flus. It is a very cost effective and natural solution to help with your breathing troubles! What and Who is Airmax Suitable for? Tagged globally as a “marriage saving device” by partners and those who suffer from snoring and its effect. The Airmax Nasal Device has been proven to largely reduce snoring for many. Do you suffer from congestion as a result of common colds and flus or from allergies? SNORING – Proven and tested by many happy people the world over to significantly reduce and or stop snoring completely! SPORTS – Increase fitness and endurance with better breathing – increases air flow through the nasal passage particularly for those who suffer from deviated septums. What does the Airmax do? 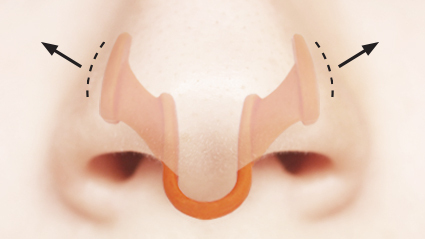 Quite simply, the Airmax nasal device has been developed to allow an increased airflow through the nasal passages. Made of a medical grade material, the specially designed “wings” lightly expand the smallest part of the nasal passages to provide more airflow to help you breathe easier through your nose. Comfortable and easy to wear. Suitable for nasal congestion (deviated septum, common cold, allergies, pregnancy), mild sleep apnea and use during sport. Is it like other Nasal Devices? 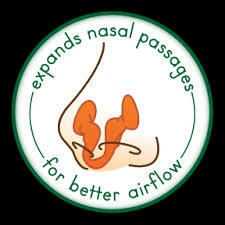 Helps to push the nasal canal open by reaching into the narrowest part of the nasal passages for improved airflow whereas most other devices generally are placed only in the lowest part of the nasal passage. Which size is right for me? The AIRMAX™ Nasal Breathing Device is available in two sizes. Small and Medium. Everyone has different sized nasal passages, we find that the MEDIUM size Airmax fits most people comfortably. If you have a particularly smaller nasal passage, we recommend the SMALL size Airmax would best suit your needs. 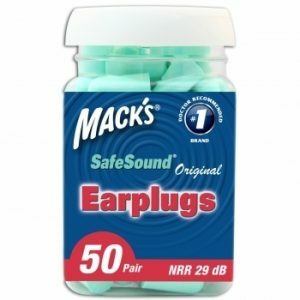 Macks is the #1 doctor recommended ear plug brand brand in the U.S., with a variety of products designed for sleep, travel, swimming and overall noise reduction. 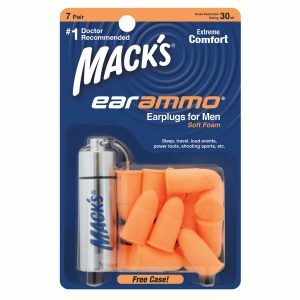 Since 1962, McKeon Products, Inc. has led the retail ear care industry with its original and #1-selling Mack’s® Pillow Soft® silicone ear plugs. What are other people who have tried Airmax saying? I have been using the AIRMAX™ Nasal Device for a month, and find it surprisingly comfortable. More importantly, no more snoring or waking up with a dry mouth. My sleep quality has improved, I wake up more refreshed and better rested. Since purchasing this product, my husband and I have been able to sleep without me worrying about waking up due to his snoring. It is lovely to find a product that works. I would like to say that this device really works. My husband started snoring in the last few years and it has gotten worse and worse, to the point I have had to sleep in another room, as it was waking me up. Then we were introduced to the AIRMAX™ Nasal Device and life has become as it was – no more snoring. Thank you, AIRMAX™! Only bought your AIRMAX™ Nasal Device 2 days ago at the Fremantle Festival Market. I can tell that it’s just what I have been looking for for years, and would buy it if it cost $100. I’m sending you this mail, as I’m probably the most enthusiastic fan of your product. I’ve used your product for several days now and the headaches that I have everymorning are finally gone. My husband is also using the AIRMAX™ Nasal Device and I’m finally relieved from his snoring. For years he had to rinse his nose every time he woke up,but with AIRMAX™ he doesn’t have to do that anymore! One word: FANTASTIC! We recommend use for at least 2 consecutive weeks, getting used to the device as it can take time for your nose to get used to the shape of the device. If your nose is not symmetrical you may have trouble initially when inserting it. 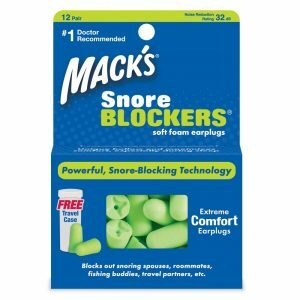 Will the AIRMAX™ Nasal Device help prevent snoring? Yes. The For many people the AIRMAX™ Nasal Device has been clinically proven to aid in reducing snoring. Clinical tests showed that 75% of patients, during various stages of socially disruptive snoring, experienced a significant reduction of snoring. Tests proved the reduction in snoring was for both duration and loudness. Can I use the AIRMAX™ Nasal Device with a CPAP machine? Yes. There should be no issues with using the AIRMAX™ Nasal Device and your CPAP machine. If you have any questions about this, we encourage you to speak with your ENT doctor. 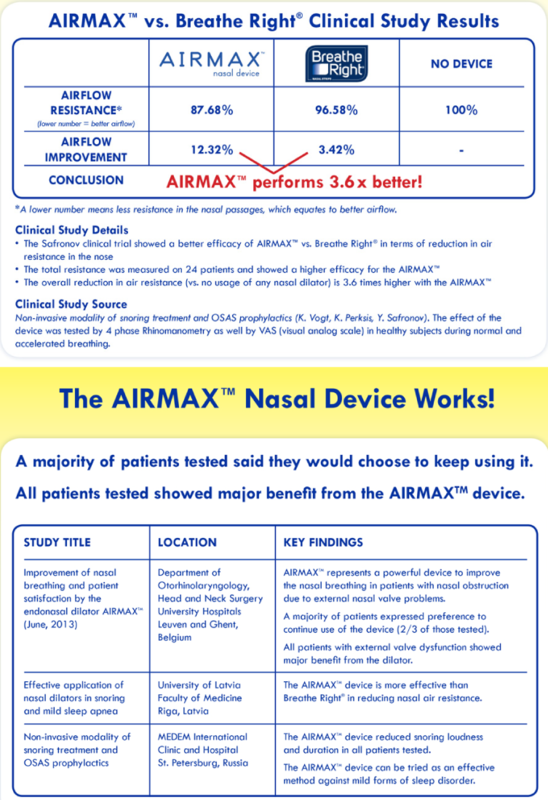 Can the AIRMAX™ Nasal Device help with sleep apnea symptoms? Since the AIRMAX™ Nasal Device improves nasal breathing it can assist some patients with sleep apnea or OSAS (obstructive sleep apnea syndrome). In clinical testing a portion of patients with OSAS actually experienced a reduction in snoring (loudness and duration) with the use of the AIRMAX™ device. As with all specific serious medical conditions, we recommend you consult your physician for treatment. Can I wear the Airmax Device during sports and or when exercising? Absolutely! The Airmax Nasal Breathing Device helps to open the nasal passage allowing more oxygen to enter the body. We all know that our bodies rely on oxygen. When we exercise we need energy, our body delivers oxygen to our muscles to create the energy we need to exercise. If we take shallow, smaller breaths, your body is not getting enough oxygen it can have a damaging effect on our performance. In a nutshell, if the body doesn’t get enough oxygen to our muscles, they simply stop working. The body needs to keep the muscles fueled with oxygen or you may experience muscle fatigue and or failure. If you are deprived of oxygen, ie your body is not getting enough, you may experience blurred vision, dizziness and nausea. When this occurs, it is best to rest and place your hands on your hips or above your head. This will relieve some pressure from your diaphragm to enable you to take deeper breathes and increase your oxygen levels. I have a slight deviated septum. Which means that the cartilage in my nose is crooked & it makes it difficult to breath through my right nostril. I have tried many different breathing contraptions over the years to try to open up my nasal passage. When I use the adhesive strips, they are uncomfortable and they give me black heads. The harder plastic stints rub on the inside of my nose and I end up taking it out halfway through the night because I can’t sleep. I tried this as another attempt to find a solution and am so glad that I did! This nasal breathing device is made of a really soft silicone/rubber like material so it doesn’t press hard against my nostrils. It took a few nights to get totally used it, now I don’t even notice it is there. I tried the small size at first and then bought the medium to compare – I prefer the medium. What a life changer. I was doubtful this product would work for me but it has made a difference I can now breathe at night. they do take a wee bit getting used to but now I hardly know its in when I’m in bed…. I was a bit dubious about another product saying it could help breathing but desperation will win out. I have had two operations to fix deviated septum and open up airways. Expensive and they did not work. It took about a week to get use to it, not that it is painful but it fell out in my sleep a few times. That seems to have stopped happening. It really does open up your nose and you do breathe much better. I have been using nasal strips for years to sleep, but really felt like I needed something stronger that actually pushes the nostrils wider open. This product does this, and it only takes a small amount of getting used to. I can feel the difference already – a worthwhile purchase indeed. I have been using sleep buddy for 3 weeks and find it very effective in my situation and very happy with it. Much better than a mask every night. I saw my Dr for snoring and had to undergo sleep testing and was told that I had sleep apnea. I purchased the very expensive equipment that I now had to get to used to wearing every night. A mate told me about this Airmax nasal device and could not speak highly enough about it. For the sake of 30 bucks I thought it was definitely worth a try. My wife and I were both amazed. I don’t use my horrible, uncomfortable CPAP mask anymore and I don’t snore! When I told my Dr about it he was skeptical. He purchased one for his wife to try and he now recommends them to his patients. If you snore and or have sleep apnea give this little thing a go! I highly recommend it. I must say, when I first tried it I thought it was a little uncomfortable, it felt a bit strange having it in my nose, although it was a darn sight better than the big uncomfortable mask. I persisted with the airmax, the after a week or two it no longer bothered me. & have rebranded and have now become Sleep and Sound!